The association between man and fish is ancient. Fish fascinates man by their brillant colours, their elegant body shapes and power in movement through the water. Their abundance but elusive to catch brings frustration to man. 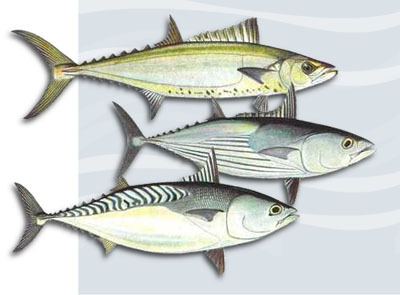 Nevertheless, since ancient times man is dependent on fish both for food and enjoyment. The sea seems vast and plentiful. Fish has become the world's largest single source of animal protein, more so than the production of beef, sheep, poultry or egg. According to statistics from the United Nations Food and Agricultural Organisation (FAO), capture fishery production in 1996 was a staggering 87 million tonnes of marine fish and 7.5 million tonnes of inland fish. However, fish stocks are not inexhaustable and a collapse in fisheries is happening in many parts of the world. The artist for this website is attracted to fish since very young. He hopes to use the drawings to stimulate his audience to appreciate the various forms and colours of fishes that inhabit our seas and inland waters. It is his goal to promote people's interest in the science of fish, and the awareness to conservation, not only of fish, but all creatures that inhabit the marine and freshwater environment of the world. Each fish drawing is done from tracing a real specimen and was executed as technically accurate as possible, including fin ray counts and scale counts. The fine details of scales were made possible by the use of colour pencils and each drawing took up to many hours to finish. eFishalbum is a new initiative sharing common interest in fish drawings. The drawings are for your enjoyment. New features would be added, including the availability of high resolution pictures, other products, or even the original drawings. You are most welcomed to offer your views at our FORUM. © 2007–2019 efishalbum.com. All rights reserved.